Let me guess, you’re frustrated with how your recordings are turning out in your home studio. They don’t have that “pro studio” sound that you long to achieve. The truth is, you’re not alone. But I have some good news, and some bad news for you. First the bad news: If you think that buying some new microphones, upgrading your audio interface, or trying out an expensive preamp is the answer, then you’re looking in the wrong place. Gear has very little bearing on whether or not you will churn out great sounding recordings. 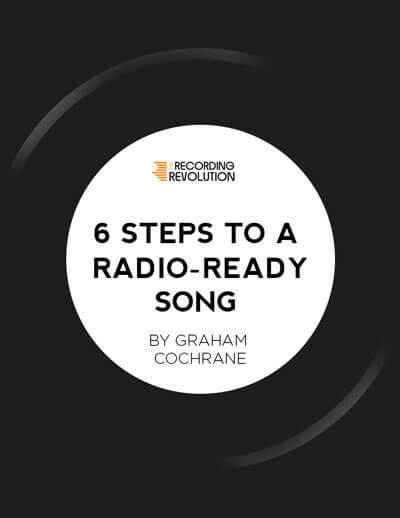 But that leads me to the good news: if you have a microphone, an audio interface, and some recording software – then you already own everything you need to churn out pro recordings. Before you can improve your recordings you’re going to have to completely change your mindset. You’ve been told a lie over and over in magazines, on internet forums, and by your “expert” audio friends that gear is the answer. Do you believe the 4 biggest myths about home recordings? If bands are recording on their iPhones, why do you need a bunch of fancy gear? So you’ve changed your mindset, and you’re willing to trust me when I say that gear is not the solution (or problem). In fact, the only thing you need to upgrade is your approach! Recording is actually a lot simpler than we make it. And that’s good news for people like me who aren’t very technical or analytical. I just want to get in there and create good music. If you want to get a great recording, you need to understand the truth about microphones. Microphones aren’t like you and me, they don’t have brains. Why a $1,000 microphone isn’t even close to being 10x better than a $100 microphone. In plain English I explain 4 ways to get more out of your current microphones. Now that you understand how to best use microphones, you need to get one more thing locked down in your approach: how you tackle recording in the digital world. Why you need to stop recording so hot into your DAW. Yes you! Why you should focus on using as few tracks as possible. Stop being a coward and commit to a sound on the way in.